By nature I'm a worrier. I worry about peace in Israel, homelessness, the enviroment, and health issues. I realize that all of these problems can't be solved by me alone. The issues are difficult ones and can only be addressed by governments, communities, and individuals, all working together. After the most recent natural disaster, hurricane Sandy, many people were left without homes, heat, or power. My family and I spent a day in Far Rockaway distributing hot dogs and hamburgers to many people in need. At that moment I realized how fortunate I was that I belonged to a famiy and a community that was able to give back to groups of families in desperate need. It was a life altering experience. As I begin my high school career, I now realize that I must choose an identity or "path" to guide me through not only high school but life. I know that I need to find a good path, one that can help me achieve goals, and help me become the person I want to be. Alternatively, the path I hope to avoid is the one that will take me in the wrong direction towards mediocrity and failure. Throughout the next four years I will be creating a path for myself, and I know how important it is to choose the right friends, achieve good grades in classes, be a good person, and the importance of respecting others. This poem clearly stresses this point, and how necessary it is for each person to choose their path and identity wisely. I then pointed out that part of their quest to understand who they were as individuals, both as people in the Western world and as Jews, included a look at where they had come from. In history, which is an integrated class of World and Jewish history, the freshmen were, during Chanukah time, studying the ancient Greeks and the effect that Hellenism had on Jewish life. The freshmen and I debated the inclusion of the hands at the top of the painting. Most were calm about the fact that the work showed God's hands; they reasoned that the anthropomorphism was simply a visual representation of the Biblical text. In fact, they argued that had the work NOT included God's hands, people might think it had been MOSES who had performed the miracle of the parting of the sea, something the Torah text explicitly does NOT want people to think! When you visit it, treat yourself after to a meal at Deck's. 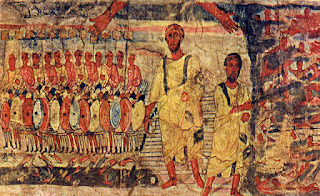 This work is a floor mosaic from the late third or early fourth century CE, when Tiberias was the seat of the Sanhedrin. The mosaic at the top of the picture makes the ruin recognizable as a Jewish place: an ark is in the middle of the mosaic, and the ark is flanked by two menorot, which are in turn flanked by a lulav and etrog and a shofar and censer. 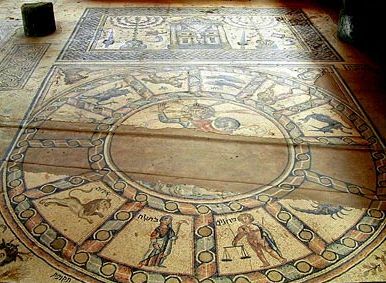 Below the mosaic of the ark is a zodiac, a common enough occurrence in a synagogue from Late Antiquity; however, this mosaic depicts Helios the sun god in its center. Most of the students agreed the Jews of this synagogue had crossed a line, had ventured into the territory of idolatry and had not been true to Jewish values. 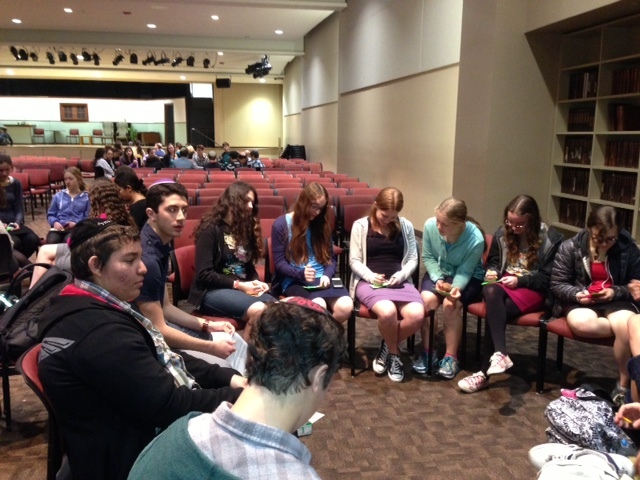 My next session during Freshman Greek Week was about Greek and Torah heroes. In short, the Greeks in their stories often succumb to fatalism and therefore heroes fall tragically, but Judaism does not have the same fatalistic view of the world, no matter what Qohelet says [for a discussion on that, see Greeks, Qohelet and Genesis]. This year I decided to experiment with the wrap-up presentation and use juniors and seniors to speak to the freshmen about where the freshmen would draw the line between their Judaism and secular culture. After planning the wrap-up session with a fellow teacher, I prepped a group of juniors and seniors, mostly students from RealSchool's Religious Identity team, and then sent my religious SWAT agents to do their work. They were fantastic. The juniors and seniors, about ten of them, took groups of about 13 freshmen each. Each freshman received a flashcard on which he/she wrote five things he/she considered inviolable about Judaism, five things the freshmen felt truly and profoundly defined them as Jews. They were then asked to imagine a scenario in which those five or at least one might be threatened. Lively discussions ensued. As my colleague and I had hoped, the freshmen felt much more comfortable talking about their religious conflicts and plans for spiritual growth with their peers as opposed to with their teachers. 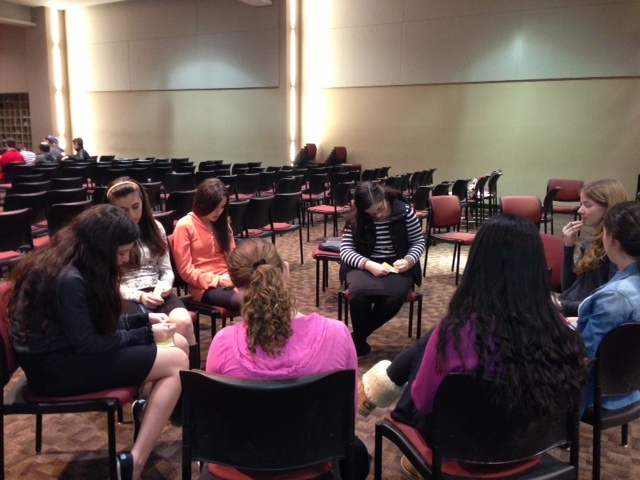 The session left me convinced that using upperclassmen to "teach" the underclassmen was a good idea, and when I asked the juniors and seniors what they thought, they said they loved the opportunity to speak with the freshmen and find ways to challenge them to grow as Jews. 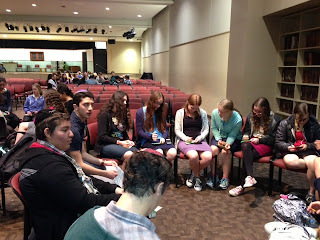 I think the exercise also forced the upperclassmen to think more deeply about their own Judaism, though the group was one that was already inclined to do so. The wrap-up went so well that I not only would ask the upperclassmen to be part of future religious discussions, but I also want them involved in presenting sessions in secular subjects during Frisch's integrated days of learning. I love the idea of peer teaching and think it will become an important part of my student-centered initiatives. Thanks for moderating the Greek Week wrap up tomorrow. Here is the outline of the session. I'll introduce and reiterate the need to draw lines in our lives, to let in from secular culture what is aligned with Torah values and to reject what is not. When everyone is done writing and brainstorming, first get myriad examples of acts and values that are the inviolables for each person. Then have kids share examples of what might threaten the inviolables. Two central dilemmas Igeret HaShmad addresses are as follows: should one give up ones life when faced with forced conversion to Islam? The question has immense implications. By sacrificing their life, they allow their children to become orphans who will almost definitely be abandoned to Islam. Conversely, by submitting to Islam in public, the Jewish identity of the children can be retained for generations to come. Another question is whether a person can be considered a hypocrite in Judaism. If the person converts to Islam but continues to observe some commandments and pray the Hebrew liturgy of the Siddur, is this hypocrisy? A person who is forced to commit one of the three cardinal sins - idolatry, adultery, and murder - in any circumstances should rather die than capitulate. This applies whether the threat was to transgress in private or in public, during a time of oppression or freedom, and whether the threat is for personal motive or in spite of Jewish belief. If the sin, however, is other than the three mentioned above, there is a difference as to whether the oppressor is out for personal benefit, or acting out of spite towards Judaism. This is one of the reasons why Esther was permitted under duress to marry the Persian king, Achashverosh, against Jewish law, since the motive of the king was for personal benefit, rather than out of spite. If the oppressor has religious motives, there is a difference whether it is a time of persecution or peace. If the circumstances took place during a period of peace for the Jews, one is only permitted to transgress if it is done in private. In addition to the laws of keeping the Jewish faith when threatened by death in certain circumstances, Maimonides discusses the need for a Jewish person to live to a high moral standard. A person who behaves in an anti - social manner causes a desecration of G-d’s name. If a person is held in high esteem, they are expected to live up to an even higher moral standard. It is more problematic when someone abandons Judaism when not under duress, but for reasons of indulgence. G-d’s name more than religious practice. 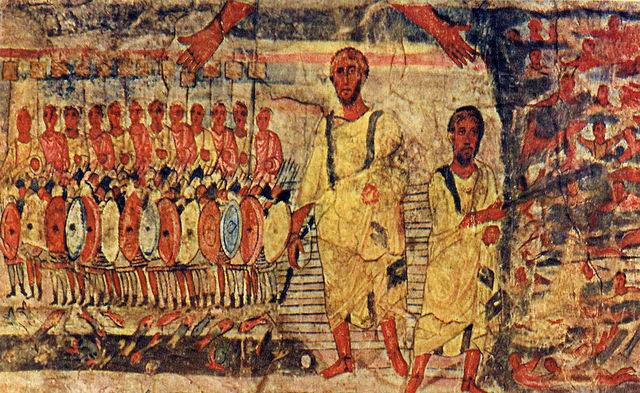 When a Jew is indeed killed for being unwavering to the Jewish faith, it is the highest virtue in Judaism, as was merited by Rabbi Akiva and his colleagues, who were killed by the Romans. Even one who is not actually killed but was prepared to die and was miraculously saved, is also called a Martyr. The four Jewish advisors to Nebuchadnezzar, Chananya, Mishael, Azarya and Daniel experienced this. They were thrown in the lion’s den for not prostrating themselves before Nebuchadnezzar’s idol, and miraculously survived. Similarly, the seven sons of Hannah refused to prostrate before the Greek ruler, Antiochus, and as a result were all put to death in front of their mother. Maimonides writes, even one who is not observant but was killed for maintaining faith in Judaism merits a portion in the World to Come. This is illustrated in the story related in the Talmud, when the entireJewish population of the city of Lod was accused of killing the daughter of a Roman king; all its inhabitants were threatened with annihilation. Two brothers, Papus and Lulinus, came forward and falsely confessed to the killing in order to spare the lives of thousands of Jews. The Talmud says that this was an act of martyrdom and the brothers ascended to the loftiest level in Gan Eden where ordinary people cannot enter. Returning to the subject of Spanish Jewry, Maimonides maintains that it is not incumbent upon a Jewish person to sacrifice their life not to convert to Islam. This is because conversion to Islam is purely a verbal declaration. One who does give up life, however, receives great reward and is indeed considered a martyr. Conversely, Maimonides concludes, even one who is obligated to sacrifice life not to convert to Islam, but does not rise to the challenge of martyrdom, and abandons Judaism under duress, is not considered an apostate and does not deserve any degradation or punishment. This is similar to a woman who is bethrothed to a man and is raped by another. The woman is not held accountable although she could have given her life and been spared the act of adultery. This is very different to the Talmudic discussion concerning idolaters who abandon the Jewish faith willingly. The Jews of Spain are all in the category of forced converts and are not considered responsible for their actions. They are permitted to testify in a Jewish court of law and may be a witness in a marriage or on a bill of divorce. Maimonides proceeds to enter into a diatribe towards the rabbi. He writes that the rabbi is sinful by expressing his opinion that Jews in Spain should die for their faith. This is compounded by the irony that this rabbi is expressing this view when he himself is living a life of religious freedom and comfort.
. Although Maimonides defends Spanish Jewry for converting to Islam under duress, he nevertheless considers Jews who remain in Spain under such circumstances to be bordering on negligent abandonment of the Jewish faith. If Jews feel they must remain in Spain, they should live covertly and stay as much as possible indoors, to avoid total assimilation. He concludes by strongly advising that Jews should flee countries that prohibit Jewish beliefs and escape, even under dangerous travel conditions, to a country where to be conspicuously Jewish is permitted. He adds that they should not be distressed for leaving behind beloved family members, nor should they feel concerned that they are forfeiting their possessions by fleeing the country, as these matters are insignificant when considering the importance of retaining ones Jewish belief. "The mark of an immature man is that he wants to die nobly for a cause, while the mark of a mature man is that he wants to live humbly for one." It's easy to make the grand gesture and say "I'll be a martyr for God" (OK, maybe it's not that easy, but it's easy to talk that talk.) It's much harder to do what Judaism asks us to do, which is to live humbly day to day, doing the small but necessary things that Judaism is comprised of. Then get the kids back to me in the front of the auditorium, and I'll end by saying that living at the line is hard, we have to feel the tension because that means we care, we should even enjoy the tension, and we should realize we have to own our Judaism because if we compromise and keep giving parts of it away, we'll be left with nothing. Therefore, as you forge your identities, you have to make sure you really own your Judaism and own your own religious growth in the same way you own your academic and extra-curricular life.